Some major storms hit the Twin Cities Tuesday night. I'm grateful I never lost power, my area had no damage, and when I went to check my storage unit the next morning, not a drop of water got in. On Wednesday, two weeks after my birthday, my boss kindly treated me to the church lunch as a belated gift. It was a southern/Mexican theme for the menu, and I particularly enjoyed the southwest pumpkin soup and the sour cream raisin bars. Very nice of her! Due to the remarkable blessing of my work projects 'behaving' and there being very few setbacks, I got through a lot more on the job and faster than I hoped...which meant no guilt about taking Friday off and doing a three-day workweek. Blessed to have the post-storm humidity break and the last couple nights be not bad. Friday was a gorgeous day for July--breezy, not humid, fairly cloudy, and only in the 70s. I was blessed I could have it off and do a bit of packing and prep-work. This one is for my mom. 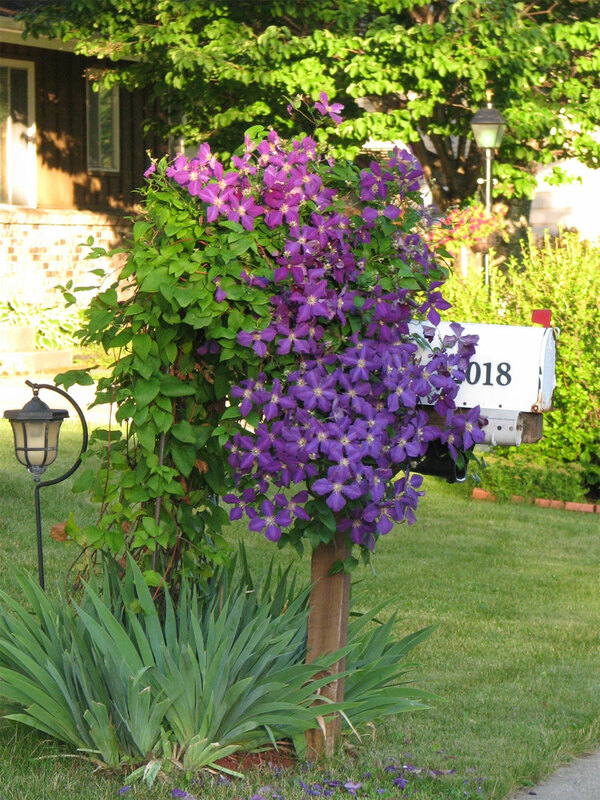 Every time I drive to the storage unit, I pass a house that has a mailbox nearly buried by a big healthy clematis vine just covered with flowers. I think of my mom every time I see it, so on Friday morning I got a photo! Got out to a showing for a condo rental Friday evening, and I quite liked the place, so I submitted an application. It was listed for September, but I asked for an earlier date because it was nearly empty already. Now, Saturday, I just got to sign a Property Hold that's offering an August 1st lease start date! Yay! picture. Maybe some year i will get to have one. has come in this evening and out temp is down to 72. I am so thankful for God's provision for you in the condo apartment! Too bad it won't be blooming when you come out to visit.